1. 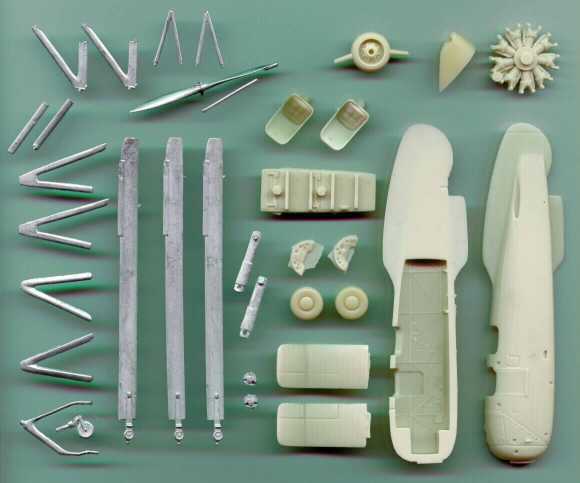 Aeroclub have taken delivery of a shipment of the 1:72 MiKu resin kits which includes all three of the Ecureuils, both the Robinson R-44's, and the AH-56A Cheyenne. These are available in limited numbers, so get your order in fast. The Xtratech Lama is available now, and the Azur 1:72 C.30 will be stocked when it's released. email or phone (44) 0115-9670044. 2. Two weeks ago I expressed the opinion that at Ј45 per kit, HKN wouldn't be likely to have a first-hand review of the JMGT Loirй et Olivier C.30 in the near future. I should have known better, since one of HKN's intrepid readers has bought TWO of them. The kit arrives in an oversize box, 13 resin parts, 21 metal parts and three decal options - two French Air Force examples, one overall green and the other in an attractive three tone camouflage, in addition to an all-grey Naval machine. The colour instructions are simplistic to say the least, but are quite nice, giving full colour details and a colour side profile of each aircraft. The resin parts are finely produced with some excellent detail on the inner cockpit fuselage, superb seats (no belts) and a lovely Salmson engine. The metal parts are again nicely produced, a nice touch being the small location lugs on the intricate metal undercarriage parts which locate into pre-drilled holes in the resin fuselage, making for quick and solid construction. The decals look to be OK and the overall accuracy seems about right though the engine looks a little underscale. I've not checked on this as yet and it may well be just an illusion. No transparencies are included - the instruction recommending that these be fashioned from clear card. The release of this quarter scale kit plugs quite a significant gap for the Gyro modeller. Numerous C.30 kits have been available over the years in 1:72, the most recent being from Aircraft in Miniature with yet another due anytime now from AZUR. In quarter scale there has to the best of my knowledge only been one other, this an all metal kit manufactured some years back by LDM. Unfortunately the LDM kit has become somewhat scarce and when it does appear commands premium prices. JMGT's offering is therefore all the more welcome, though at an incredible Ј45.00 (yes, forty five - not a misprint) you probably will not be buying them by the case. 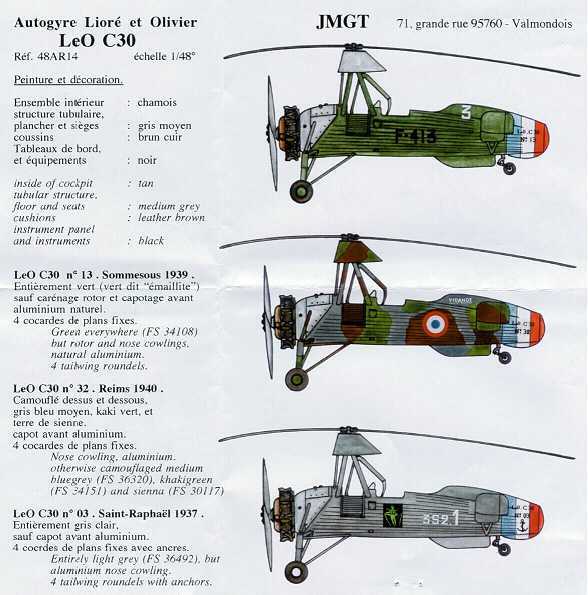 Although this is a kit of the C.30 which was license produced by French manufacturer Liorй et Olivier, the differences between the French and the Cierva/Avro produced examples are minimal, giving the modeller plenty of scope to back-convert. A 1:48 7-cylinder metal Genet engine is available from Aeroclub, #E.402. Overall quite superb but terribly over priced. 3. Zvezda have their own website, in Russian only, where you will find a catalogue which includes the 1:72 Mi-8 #7230 for which we have been waiting for so long. I take this to be a good sign. 4. Hannants are now listing the latest re-box of the 1:72 KP Mi-8 in German SAR markings. The picture shows that the paint and marking scheme appears to be identical to that supplied in the Revell boxing of this kit, #4423, which was released in 1993. 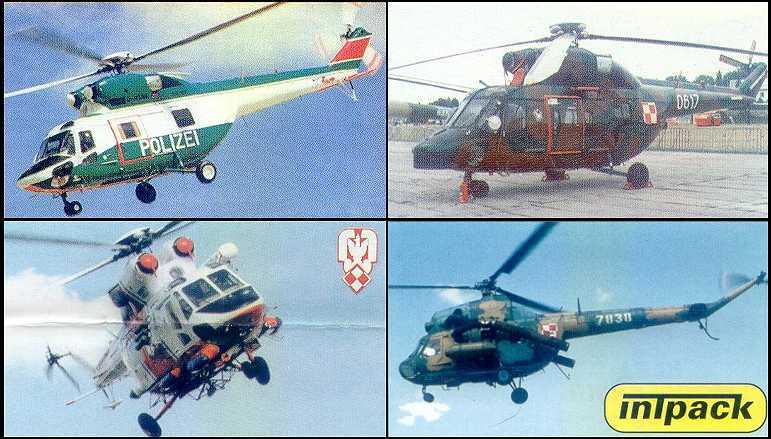 PZL Mi-2 'Hekla' #T.61, Polish AF x2. This modification of the Mi-2 features a smoke generator and external ducting. Okay, I admit it: after hearing all the bad reviews of Zhengdefu products, I felt compelled to buy a cheap one to see how bad it is for myself. :) I haven't started the kit yet, but I just thought that our American neighbours might like to know that according to the decal sheet, China thinks the Apache is used in the UNITED STAATES ARMY. Oh, and the pilot looks like he was in Chernobyl when it went off. PS: What's in that little tube in the kit, anyhow? Glue? Smelling salts when you see the 'quality' of the kit? There are also quite a few Reverine subjects listed from Replicas By Tyson. These are display models and can be quite expensive. We list them in ESM 72 knowing quite well that they are beyond most modelers' budgets, but if you really want a model of a Riverine craft Tyson is by far the best source. If you are looking for a particular craft let us know and we'll check the Tyson list for you. If anyone can add to this list please drop us a line. Thanks to Pete Tasker, Stanley Lui, The Turntable, Aeroclub, and Tom Young.